Think about what happens to a car in a sharp turn. If you are inside the car, you know that your body gets pulled toward the outside of the turn. The same thing is happening to all the parts of the car. So the part of the car on the outside of the turn gets pushed down toward the road and the part of the car on the inside of the turn rises up. In other words, the body of the car "rolls" 10 or 20 or 30 degrees toward the outside of the turn. If you take a turn fast enough, the tires on the inside of the turn actually rise off the road and the car flips over. Roll is bad. It tends to put more weight on the outside tires and less weigh on the inside tires, reducing traction. It also messes up steering. What you would like is for the body of the car to remain flat through a turn so that the weight stays distributed evenly on all four tires. A stabilizer bar tries to keep the car's body flat by moving force from one side of the body to another. 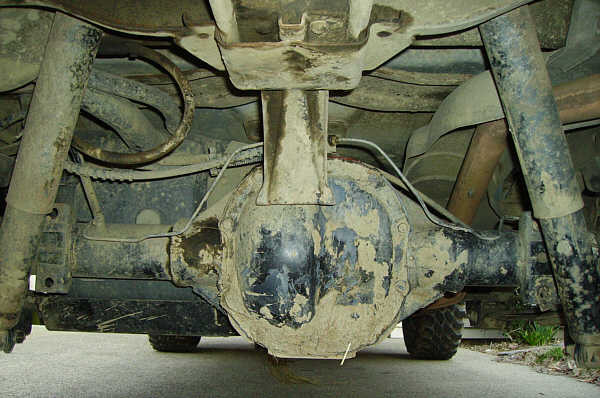 To picture how a stabilizer bar works, imagine a metal rod that is an inch or two (2 to 5 cm) in diameter. If your front tires are 5 feet (1.6 meters) apart, make the rod about 4 feet long. 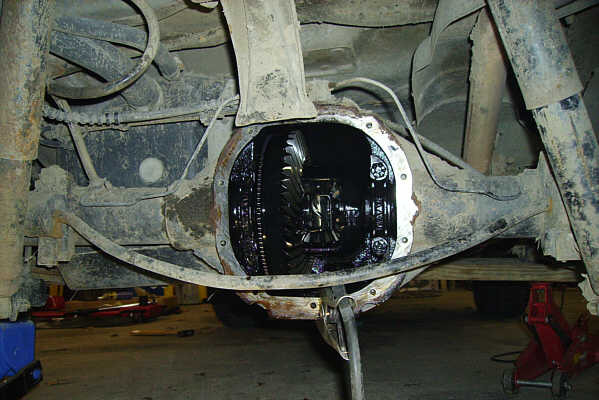 Attach the rod to the frame of the car in front of the front tires, but attach it with bushings in such a way that it can rotate. Now attach arms from the rod to the front suspension member on both sides. When you go into a turn now, the front suspension member of the outside of the turn gets pushed upward. The arm of the sway bar gets pushed upward, and this applies torsion to the rod. The torsion them moves the arm at the other end of the rod, and this causes the suspension on the other side of the car to compress as well. The car's body tends to stay flat in the turn. If you don't have a stabilizer bar, you tend to have a lot of trouble with body roll in a turn. If you have too much stabilizer bar, you tend to lose independence between the suspension members on both sides of the car. When one wheel hits a bump, the stabilizer bar transmits the bump to the other side of the car as well, which is not what you want. The ideal is to find a setting that reduces body roll but does not hurt the independence of the tires. Of course, the above applies to normal cars, not for what we want. The important sentence for us is the last in the article... "The ideal is to find a setting that reduces body roll but does not hurt the independence of the tires." and so on 17th March 2006, the rear sway bar was removed from "The Ho". This does affect road handling a bit as it does now lean when cornering but as "The Ho" is mostly used off road then articulation is more important. On 16th March 2006, Dave and I had a "pull-off" and, sad to say, "The Ho" was pulled backwards by the Jeep. These competitions are about weight and road grip rather than power. Both cars weigh around 4,000lbs, and both around the same power, in fact "The Ho" has a slight advantage here, 155hp as compared to 127hp. The only real difference is the tyres. "The Ho" is running on the Dunlop Mud Rovers whilst Dave uses the extra wide all-terrains. The fourth trip was to the Badlands, Attica, Indiana on 18th March 2006. Andy drove up there in his GMC K3500 truck pulling "The Ho" on a dolly. Dave drove his Jeep Wrangler up there. 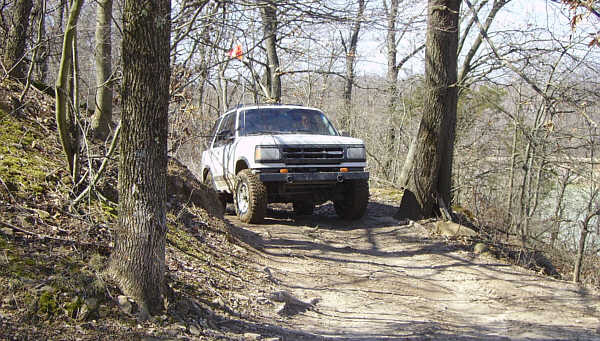 The Badlands is a privately owned, 700 acre off-road park near south west of Lafayette, west Indiana. It has sand dunes, rock, creeks, mud and woodland and so offers a variety of terrains for off-roaders.